Whilst clearing rubbish from the allotment, there was a small glimmer of magic that came in the form of glass bottles. I’m a natural magpie when it comes to stumbling upon lost things, and the appeal of old glass bottles was very much a welcome discovery. The fact these bottles have been buried and survived all these years under heaps of mud and rubbish, makes me even more determined to rehome them in a way in which they can be admired. At first I thought I was lucky finding one, but it soon became apparent this was going to turn into a treasure hunt, as the excitement of finding more kicked in. One by one, my pile started accumulating and it made me really appreciate the random nature of this collection. 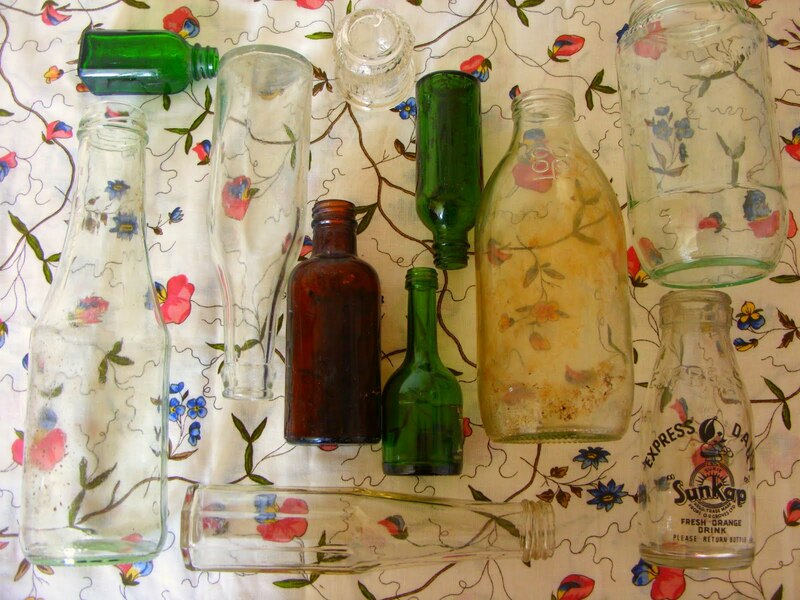 For these bottles had never really belonged to anyone, discarded and left for rubbish, waiting a lifetime to be found. 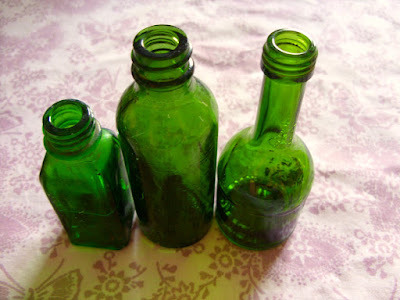 The allure of green bottles just reminds me of the childhood nursery rhyme Ten Green Bottles. Though my favourite has to be this Sunkap orange drink bottle, I've never quite seen anything like it. I love the cutesy illustration and can’t wait to put it on display in my craft room. 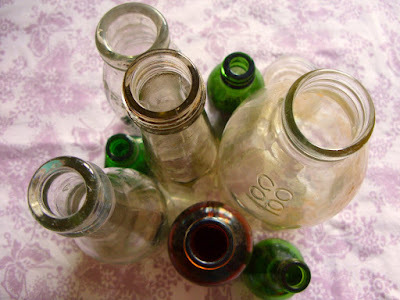 Who ever knew a collection of glass bottles could get me so inspired and craving more. Wow that's so interesting, finding a whole load of them in one place! I love the old green ones, the glass looks fairly thick in them so they might have some age. They are certainly pretty regardless! How exciting to find them all. 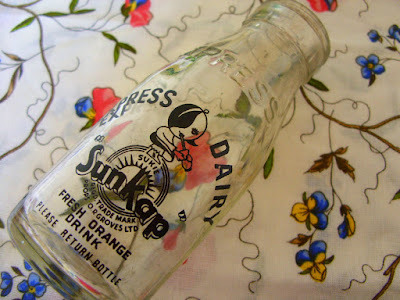 I love the little Express Dairy bottle, I have a similar milk bottle to it. I have the same on my allotment, there were hundreds of victorian bottles, the bloke who had it before me used to go bottle collecting on a victorian tip, and dump them all in the greenhouse and around the allotment. I have a selection on my kitchen windowsill, I love the tiny ones and odd shaped ones, we sold a load on ebay, but only got about £20 for them, theres still loads in the greenhouse but my husband will kill me if I bring anymore home, I collect enough junk as it is !! Oh awesome find - love coloured glass! I have some bottles from the village where I grew up, there used to be a pop factory there and my dad found a load of them. Those bottles are beautiful! Definitely buried treasure - I think they'd look great as a table centrepiece with a single flower in each! The green bottles are gorgeous and the express dairy bottle is really fab! I have a thing for glass bottles and have a shelve full of them. I like to put single flowers in each. Awesome find! I love glass bottles, bit of a weakness of mine!